Mr. Henry recently turned 10. 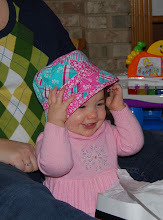 She has managed to extend her birthday celebration into an entire month. 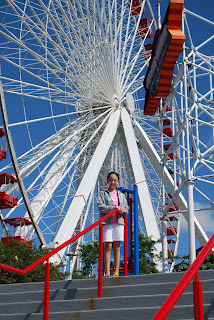 First, the hubby and I took her to Chicago for a mini-vacation. She loves Harry Potter. So, we took her to the Museum of Science and Industry to see the Harry Potter exhibition. they all kinds of props from the movie and explanations about how things were done. While at the museum, we also saw Harry Potter and the Half Blood Prince at the IMAX theater. While in Chicago, we also managed to catch up with some old friends of mine from college, go shopping on the Miracle Mile (hubby was so thrilled) and play at Navy Pier. Second, we had a party for the family. Nothing too big, just the grandparents and uncle/aunts. Mr. Henry is not a cake kind of girl; she is more of a cupcake girl. 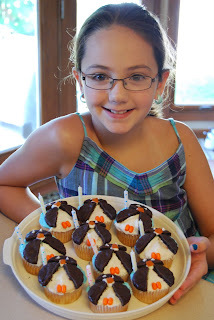 So, we made cupcakes with her favorite animal-penguins. These were so easy and cute. Finally, we are having a slumber party next Friday for nine of her friends. It will be, of course, Harry Potter themed. I have plans for Herbology, Transfiguration, Potions, and Quidditch. It should be fun. Mr. Henry is really looking forward to it. I still wonder how she conned me into an entire month's worth of celebrations. It's a good thing you only turn 10 once.